This is the first time in the Bible that anyone is addressed by the word coen, the Hebrew word for priest. As a “priest of God Most High,” Melchizedek “brought out bread and wine.” What is the connection between his priesthood and those two offerings? During the days of Genesis 14, the priest did not need to offer the bloody sacrifices, for these only became necessary later, when Israel became enslaved and addicted to the gods of Egypt (see Exodus and Ezekiel 20). God’s strategy to break Israel from these idolatrous customs was to make the people sacrifice ceremonially on Mount Sinai the very animals they had worshiped as gods in Egypt. Before this, before the Golden Calf, the pre-Israelites practiced a patriarchal family religion rooted in nature, in which fathers were high priests and their firstborn sons were priests under their authority. What was the sacrifice then that pleased God? Well, here we see it: bread and wine offered by God’s premier priest, Melchizedek. He offered bread and wine to Abraham who had come and paid his tithes. Abraham received bread and wine and then received a blessing. This would become the pattern of the Eucharistic liturgy: worshipers give their offerings; then Christ, working through the human priest, gives his body and blood under the appearance of bread and wine; and then the priest gives the blessing. The New Testament begins, “This is Jesus Christ, the seed of the son of Abraham, the Son of David.” Jesus Christ is the one through whom God fulfills the oath he swore to Abraham. Where did he swear it? On Moriah, the hill where the temple was later built and where Christ, the New Temple was later destroyed and rebuilt three days afterwards. We have this as a sure and steadfast anchor of the soul, a hope that enters into the inner shrine behind the curtain, where Jesus has gone as a forerunner on our behalf, having become a high priest for ever after the order of Melchizedek. The first ten verses of chapter 7 describe how Abraham met Melchizedek. The author explains that this strange Hebrew name means “king of righteousness.” He is the King of Salem, which means “peace” (shalom); we know from Psalm 76.2 that Salem would later become Jeru-salem, the City of Peace. Melchizedek is the priest of God Most High, and he blessed Abraham; thus, he was superior to Abraham. In these passages from Hebrews, everything is mentioned about the meeting between Abraham and Melchizedek except one thing — the bread and the wine. Is this because the bread and the wine were the only unimportant details? Or is it because their importance is so great, but so obvious, that it goes without saying? Let’s study briefly the next few chapters to see whether the writer understands Melchizedek’s priesthood in relationship to the bread and the wine that he gave to Abraham. The parallelism of these phrases indicates that the author considers status as “God’s Son” the same as priesthood “after the order of Melchizedek.” As I mentioned earlier, in the years before the Golden Calf, fathers were high priests, and firstborn sons were priests under their authority. This, then, would be the family pattern of Melchizedek; and this is how the ancient Jews, as well as the ancient Church Fathers, understood Melchizedek’s priesthood. In Israel, only a Levite could be a priest; yet Jesus was not a Levite. So Old Testament Jews might be tempted to say that he couldn’t be a priest. The book of Hebrews, however, alludes to the wilderness generation under Moses, which committed idolatry and rebelled against God. Their rebellion was the Golden Calf, and God’s punishment was to take away the priesthood from the firstborn and give it to the Levites temporarily. The writer of Hebrews is suggesting that Jesus Christ, God’s Son, is righteous enough to restore the original pattern of the father-son family priesthood — the “order of Melchizedek” — because God, through Christ’s sacrifice, is adopting us into a divine family. He is a “priest forever after the order of Melchizedek.” The word “order” here does not mean a religious order like the Dominicans or the Franciscans. It means “after the manner” of Melchizedek’s priesthood. The writer goes on to draw a sharp contrast between the Levitical priests, who continued to offer animals in sacrifice, and priesthood in the order of Melchizedek. Levites had to kill. They had to sacrifice millions of sheep, millions of goats and millions of cattle, with millions of gallons of blood running down through the temple. Why? It was all because of the Golden Calf; whereas, before all that, priestly fathers and their priestly firstborn sons constituted a clean priesthood, represented by Melchizedek. “After the order of Melchizedek” suggests that Melchizedek’s manner of priestly sacrifice—bread and wine—was the manner in which the early Christians understood Christ’s priesthood as well. On the one hand, a former commandment is set aside because of its weakness and uselessness (for the law made nothing perfect); on the other hand, a better hope is introduced, through which we draw near to God . And it was not without an oath. 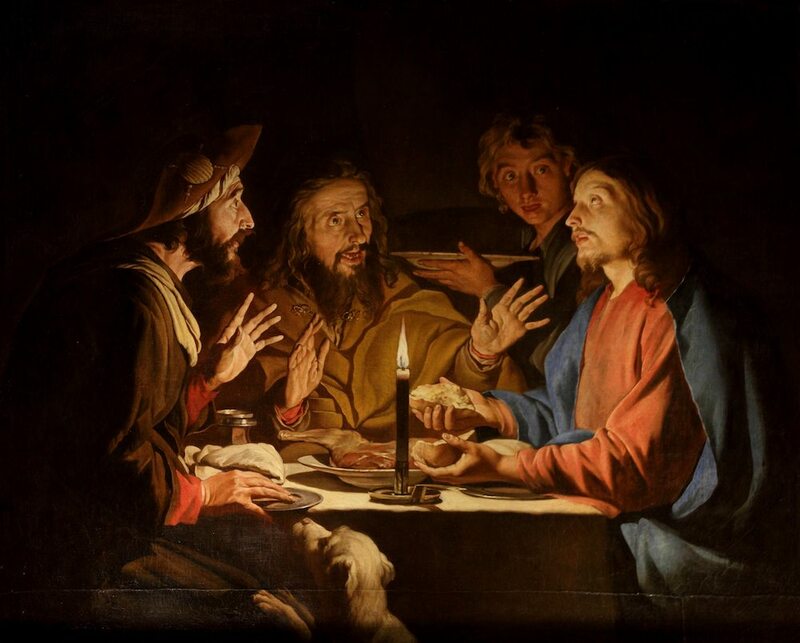 Those who formerly became priests took their office without an oath, but this one was addressed with an oath, “The Lord has sworn and will not change his mind, ‘Thou art a priest for ever.’” This makes Jesus the surety of a better covenant. The former priests were many in number, because they were prevented by death from continuing in office; but he holds his priesthood permanently, because he continues forever. Consequently he is able for all times to save those who draw near to God through him, since he always lives to make intercession for them. For it was fitting that we should have such a high priest, holy, blameless, unstained, separated from sinners, exalted above the heavens. He has no need, like those high priests, to offer sacrifices daily, first for his own sins and then for those of the people; he did this once for all when he offered up himself. Indeed, the law appoints men in their weakness as high priests, but the word of the oath, which came later than the law, appoints a Son who has been made perfect forever. There’s plenty to feed our souls, if we pay close attention; we can only cover a few details in this short article. The crucial point to recognize is that we have such a high priest, one who is seated at the right hand of the throne of the Majesty in heaven. In the book of Revelation, we discover that the Lamb is the one enthroned (Revelation 5). The Lamb — who is the firstborn Son of the Passover — is the priest who ministers in the heavenly sanctuary. He is ministering in the true tabernacle, which is set up not by man but by the Lord. Yet every high priest is appointed to offer gifts and sacrifices. Hence it is necessary for this priest to have something to offer. I read this passage a hundred times before the obvious meaning hit me. Jesus Christ is a priest in heaven, ministering now in the sanctuary; and, as our High priest, he’s continually offering. What, though, is he offering? He’s not bleeding and dying and suffering any more. He’s not killing any animals—but he’s continually offering the once and for all sacrifice which is himself. It’s a continual sacrifice, a perpetual offering. This mystery is exactly what the Catholic Church has always taught about the meaning of the Mass. For many years, I didn’t understand this. Then, after reading some basic catechisms, I understood it, but still didn’t believe it. Finally, after prayerfully studying and re-studying Hebrews, it became clear that Jesus Christ, the firstborn Son—which is the theme in the Book of Hebrews—is a much greater priest than the Levites. They had merely took the place of the sinful firstborn sons until the true and righteous firstborn Son of God would come. Before, we had an Old Covenant family on earth. Now, we have a New Covenant family in heaven—our divine family. The Trinity’s life is our family life, and it comes to us through God’s firstborn Son, who was like Melchizedek in being a son-priest. But the bread and the wine that Christ offers is not earthly bread and wine, but heavenly bread, heavenly wine—his own body and blood. He is still, today and forever, a minister in the sanctuary, the true tabernacle in heaven. Since every high priest is appointed to offer gifts and sacrifices, God has appointed his own Son to be High Priest. What are his gifts and sacrifices? Himself—and all of us in union with him! Moreover, the sacrifice isn’t finished. No, it’s just begun, and we’re going to be offering it forever with Christ. Not bloody animal sacrifices, but our hearts and our souls and our bodies in union with the One whose body and blood, soul and divinity are perfect and pure—the only acceptable sacrifice, which makes our otherwise unacceptable sacrifices perfectly acceptable: “Holy and righteous,” as Paul says (Romans 12.1). In Hebrews 8, the author proceeds to talk about the superiority of the New Covenant that Christ established. Now it’s unfortunate, but our over-familiarity with that phrase, “new covenant,” may cause us to miss its uniqueness. We’ve heard this phrase so many times that we may have become insulated from its spectacular meaning, almost as if filters have been planted in our ears so that we don’t hear it any more. The days will come, says the Lord, when I will establish a new covenant with the House of Israel and with the house of Judah; not like the covenant I made with their fathers on the day when I took them by the hand to lead them out of the land of Egypt; for they did not continue in my covenant. When did Israel break the covenant? At the time of the Golden Calf. Yet the New Covenant will not be like the Mosaic Covenant, which was broken because of the failure of the firstborn sons. The New Covenant will not be broken because this firstborn Son won’t break it—and that’s what makes it new. The Old Testament uses the phrase “New Covenant” only once, and Jesus uses it only once. When does he use it? At Passover. Where? In the Upper Room. Why? To institute the Eucharist. Still, the writer of Hebrews has placed a singular focus upon this phrase. If you’re judging only by numerical usage, he’s made a mountain out of a scriptural molehill. However, it’s not the frequency of a phrase that makes it important. Jesus used “New Covenant” only once, when he transformed the Old Testament covenant of Moses, the Passover Covenant, by offering himself as the unblemished Lamb, the firstborn Son, the Priest, the King, and the Victim all wrapped up in one. That is the New Covenant. Hebrews 9 then goes on to speak of the superiority of this New Covenant. In verse 9 we read, “According to this [Old Testament] arrangement, gifts and sacrifices were offered which cannot perfect the conscience of the worshiper.” What contrast is the author implying? Back then, Israel’s sacrifices couldn’t perfect the worshiper’s conscience; but the implication is that the New Covenant sacrifice do perfect the conscience of the worshiper. That, in fact, is what the Eucharist does. It cleanses our soul. It wipes away all venial sin. 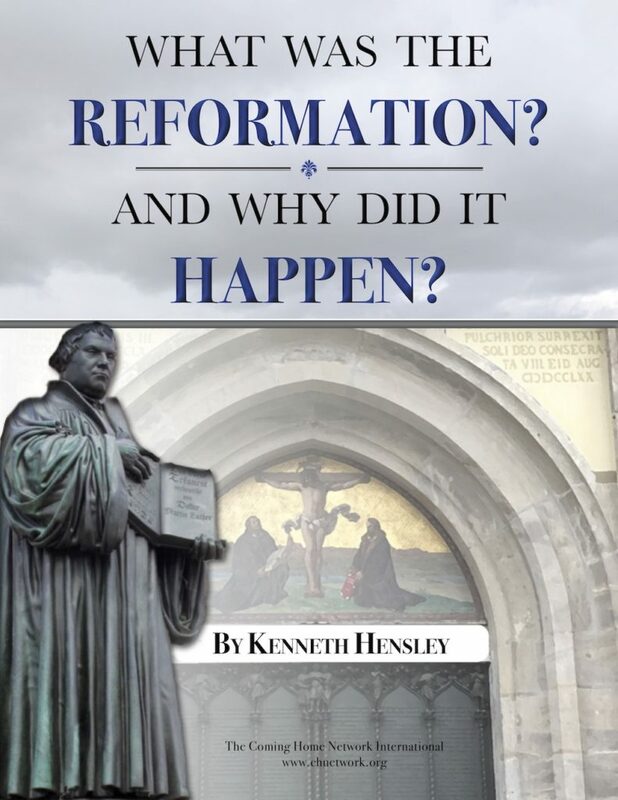 These Old Testament sacrifices (verse 10) “deal only with food and drink and various ablutions [baptismois in the Greek], regulations for the body imposed until the time of reformation.” Do you know when the real reformation came? The real reformation came in the Upper Room, when Jesus instituted the Eucharist, and when he established the Catholic Church. The true reformation wiped away the weak, ineffective Old Testament sacrifices. Would it do away with sacrifices altogether? No. The true reformation would initiate a new sacrifice, which has intrinsic power to cleanse our consciences. Then in verse 11: “But when Christ appeared as a high priest of the good things that have come, then through the greater and more perfect tent [or tabernacle] (not made with hands, that is, not of this creation) he entered once for all into the Holy Place [that is, heaven], taking not the blood of goats and calves but his own blood, thus securing an eternal redemption.” He took his own blood to heaven. He’s not bleeding in the sense that he’s suffering and dying, but he’s up there as a Lamb looking as though he’s been slain, offering his own blood. That’s a Eucharistic Passover sacrifice and that’s why the entire structure of the book of Revelation is a Passover liturgy. This scripture passage goes on to contrast the Old Testament’s weakness with the New Testament’s power. “For if the sprinkling of defiled persons with the blood of goats and bulls or with the ashes of a heifer sanctifies for the purification of the flesh, how much more shall the blood of Christ, who through the eternal Spirit offered himself without blemish to God, purify your conscience from dead works to serve the living God?” (verses 13-14) The body was cleansed externally in the Old Testament sacrifices; but with Christ’s Passover Sacrifice, which he continues to administer in the heavenly sanctuary, our consciences are cleansed internally as we offer and receive the Eucharist here on earth. “Therefore,” says verse 15, “he is the mediator of a New Covenant.” Again, Jesus only used the word “covenant” one time—when he instituted the Eucharist; when he fulfilled Jeremiah 31; when he offered what appeared to be bread and wine—and that’s when he became the new Melchizedek, feeding and blessing the new children of Abraham, so that through Abraham’s seed—Jesus—all the nations of the world, all the families of the earth shall be blessed. This is the oath God had sworn to Abraham on Moriah, but which would not be fulfilled until Christ, the son of Abraham, was sacrificed on Calvary, a hillock on Moriah’s range. Jesus began his sacrifice in the Upper Room when he instituted the Eucharist, and it is this Eucharist which continues, here on earth and in heaven above, forever and ever. Jesus is the mediator of the new and everlasting covenant, so that those who are called may receive the eternal inheritance that God promised to Abraham. In verses 24-25: “For Christ has entered, not into a sanctuary made with hands, a copy of the true one, but into heaven itself, now to appear in the presence of God on our behalf. Nor was it to offer himself repeatedly, as the High Priest enters the Holy Place yearly with blood not his own.” Jesus offers himself repeatedly, not like the Old Testament priest who shed blood that wasn’t his own. Instead, he offers himself repeatedly, without any death and suffering, an unbloody sacrifice. “For then He would have had to suffer repeatedly since the foundation of the world. But as it is, He appeared once for all at the end of the age to put away sin by the sacrifice of Himself” (verse 26). So what can we conclude ? Christ has abolished the Old Testament, and he’s established the New Testament. We have a sacrifice in heaven that is perpetual and effectual. Read Hebrews 10.19: “Therefore, brethren, since we have confidence to enter the sanctuary by the blood of Jesus.” It’s because of the Eucharist and because of Christ the High Priest offering himself that we have confidence to draw near to the presence of God. That’s how the apostle John could be drawn up in Revelation. That’s why the scroll’s seals could be broken open. “[W]e have confidence to enter the sanctuary by the blood of Jesus, by the new and living way which he opened for us through the curtain, that is, through His flesh” (verses 19-20), his body and blood. When were they offered? His body and blood were offered when He instituted the New Covenant in the Upper Room. If Jesus Christ, who is our master, gave himself up for us, we too have to learn how to treat others as though they are more important than we are. Let’s figure out new ways to stir each other up to love and good works. “Not neglecting to meet together, as is the habit of some, but encouraging one another, and all the more as you see the Day drawing near” (verse 25). The Lord’s Day, from the earliest time of the Church, was the regular meeting for the people of God. From both pagan and Christian testimonies, we know that, early on Sunday morning, the faithful would gather together. They would sing hymns worshiping Christ as God, and then—we are told by a pagan historian—they would take an oath. The Latin word is sacramentum. They would take an oath—a sacrament—and swear not to sin. What does this mean? It means that if we sin deliberately after receiving the knowledge of the truth—the truth of Christ’s sacrifice, which is represented in the Eucharist on Sunday— we are repudiating the only sacrifice that will work for our sins. This is what people do when they neglect to meet with the Church on the Lord’s Day, when they fail to go to Mass, “as has become the habit of some.” When we neglect this obligation, we sin against the most beautiful laws God has delivered to humanity and against the all-powerful sacrifice. We are called go there. We’ve got to be there, but we’ve got to prepare to be there with all our heart and mind, soul and body. We’ve got to be there with the help of the Holy Spirit. We’ve got to offer ourselves in union with Christ, because we are members of his mystical body, and that body is what’s being sacrificed continually. If we don’t, we profane the blood of the covenant; but if we do, what will happen? In the Eucharist, we receive the blood of the covenant, which makes our souls right with God, which equips us to do his will. The meal of Melchizedek is the bread and the wine, but it’s so much more. We go beyond the appearances of bread and wine to the reality of the Son of God and His body and blood, soul and divinity. By that one sacrifice, we have confidence. By that one sacrifice, we have forgiveness. By that one sacrifice, we’ve got power to do the will of God.